Today I said goodbye to an old friend: my 1994 Ford Econoline van, in all its Tobago green glory. I called last week to arrange to donate it to my local public radio station, and it was picked up this morning by tow truck. Once it’s sold at auction, I’ll get a tax deduction. I’ll also avoid sinking any more money into hopeless repairs. The engine was shot, but I might have kept it if not for the latest problem it developed. A cable essential to the operation of the wheelchair lift snapped in two, and it’s an old brand (Ricon) for which replacement parts are no longer available. Since the end of the tax year was fast approaching, I made the decision to let the van go. That van was important to me for several reasons. It was the first vehicle I bought with my own hard-earned money — as well as the hard-earned knowledge about how to do so, using a Social Security “work incentive” program called Plan to Achieve Self-Support (PASS). Under my PASS, I was able to keep my SSI and Medicaid benefits while working. By spending some of my earned income on car payments, I was able to “set aside” that income, so it was not counted in determining my eligibility for benefits. By purchasing the van, I not only got a vehicle I needed — I also launched what would become a fairly successful consulting career, without losing essential health care coverage. I was able to use the van to get to meetings, presentations, and other professional destinations. In addition, during the past decade and a half, the van also carried me, my partner, attendants and friends on some weird and wonderful journeys. We drove it to Jefferson City, Missouri, in 1998, to teach self-advocacy skills and independent living history to a Partners in Policymaking group. In 1999, we drove all the way to Louisville, Kentucky, to meet with disability movement leaders for a strategic discussion of media messages and images. In 2004, Robin and I took a carefree vacation on the coast of Oregon, along with my family and several friends. Unexpectedly and very sadly, we learned that a dear friend of ours, Tanis Doe, had died at her home in Victoria, BC. We traveled up through the northwestern US and into Canada, and spent a week helping to organize Tanis’ memorial service and some of her other affairs. Although I was grieving, I also felt very fortunate that we had both the mobility — in the form of my trusty Ford van — and the support of a team of attendants, to be able to go bid farewell to Tanis in such a meaningful way. Now, for a while, Robin and I will be a one-car family. That should work, as long as her Dodge Caravan can carry on. 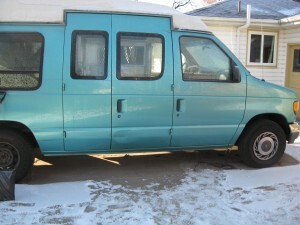 I’ll miss my van, but will honor the role it played in my life of work, mobility, friendship, independence, and adventure.